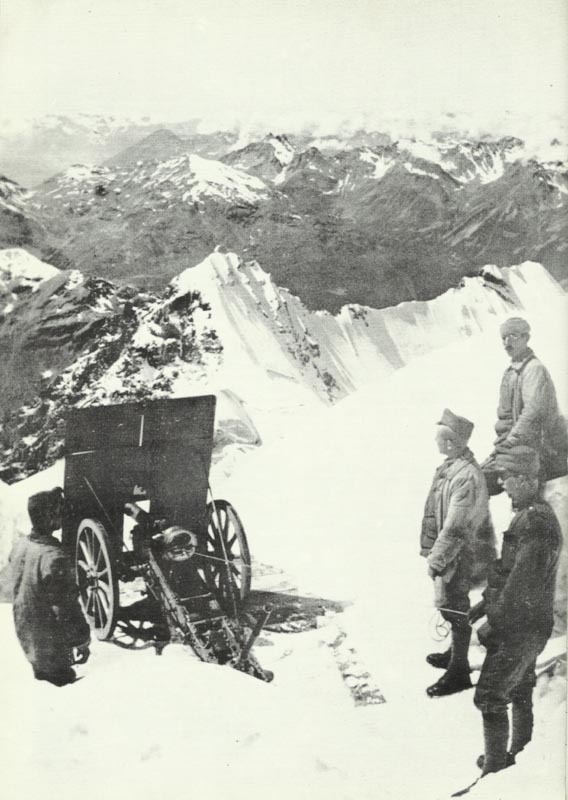 Austria-Hungarian mountain gun on Pleisshorn in the Ortler range in more than 3,300 yards above sea level. Italian Front: Italian Isonzo attacks and also advance in Ortler range (Upper Adige); 45th Infantry Regiment capture Cima Bois. Poland: Siege of Novo Georgievsk (Modlin) (until August 20) by Beseler, captor of Antwerp. Gallipoli – Anzac bridgehead: Decisive counter-attack by Turkish troops lead by Kemal retakes Chunuk Bair, the ‘Farm’ and the ‘Pinnacle’, annihilating 2000 British soldiers. Gurkhas retire from Hill Q.
Suvla bridgehead: 54th Divisions lands joining 53rd Division. Baltic: German fleet shells Riga but is driven off. Russian battleship Siava engages German battleships Nassau and Posen. Japan: Marquis Okuma, Foreign Minister, replaces Prime Minister Kato (resigned August 9), Baron Ishii succeeds Okuma on August 12. Turkey – Armenian Anatolian College: 400 students deported, all male students murdered. Germany: Kaiser awards Tirpitz Pour le Merite on 25th anniversary of Heligoland occupation. USA: Plattsburg New York State military training camp for civilians opens. This battle was on August 8. August 10 they managed it.